Ssangyong offers five-year warranty | What Car? 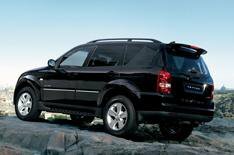 Ssangyong has extended its warranty for new cars to five years or 250,000 miles. The move is intended to demonstrate Ssangyong's confidence in its own build quality and reliability. The company says that it's a permanent change and not just a short-term marketing ploy. Ssangyong will also offer customers five years/50,000 miles of free servicing and three years' European AA cover if they buy before the end of June.